Commercial Painting Contractors, Charlotte, NC | Pride Painting, Inc.
We didn’t get to be one of the longest-standing commercial painting contractors in the area by accident. Owning a commercial property involves many aspects of maintenance, so you can preserve your investment and generate an income. One of those is keeping up with interior and exterior painting so that your building does not become outdated and unappealing. When you are looking at commercial painting contractors serving the Charlotte, North Carolina area, there is one that will stand out as one of the longest-standing in the area: Pride Painting, Inc. In 1996, two experienced commercial painting contractors, Bob Bass and Mike Palladino, joined forces with their more many years of experience in the painting industry to form this company. It is their vision of excellence that has made us what we are today, an A+ rated company with the Better Business Bureau and the preferred choice for office buildings, shopping centers, and many other types of commercial buildings. We put our heart and soul into every project as customer-focused commercial painting contractors. We understand the complex nature of commercial painting projects. We will work with you to minimize the disruption to your business operations and provide you with everything from a color consultation to a 3-year written guarantee to make certain you are 100% satisfied. 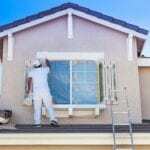 We are confident that once you have trusted us with an interior or exterior painting project, you will agree that we are the best commercial painting contractors in the Charlotte area. Contact us today to schedule your free estimate and/or color consultation. We are happy to answer any questions you may have.